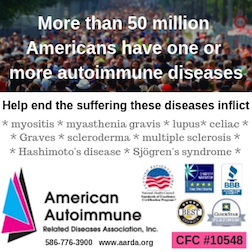 Autoimmunity causes Lupus, Arthritis, Celiac, MS, Type 1 Diabetes, Graves', Thyroiditis and 100+ other diseases. Through research and patient services, our work eases the suffering they inflict. * The young woman, recently diagnosed with the autoimmune disease "lupus" who came to us pregnant and despondent. In questioning her, we discovered a history of miscarriages and suggested she be tested for antiphospholipid syndrome (a little known, but treatable, autoimmune disease that can cause fetal loss). It led to her first successful full-term baby. research program at the National Institutes of Health. of "lupus," "CFS," "Graves' disease" and Type I Diabetes, and spotted the necessary puzzle pieces that led to a diagnosis of "Wegener's" disease. She's now getting appropriate treatment and leading a near normal life again.